Desmond is six months old today and it’s hard to believe I’ve been a mom for half a year. And this is kind of wild: on April 10th last year I shared the post announcing that I was pregnant. We’ve come full circle. I had no idea what the next year of my life would look like when I wrote that post. Our infertility and pregnancy journey had already been so long at that point that I couldn’t imagine the end being anywhere in sight. 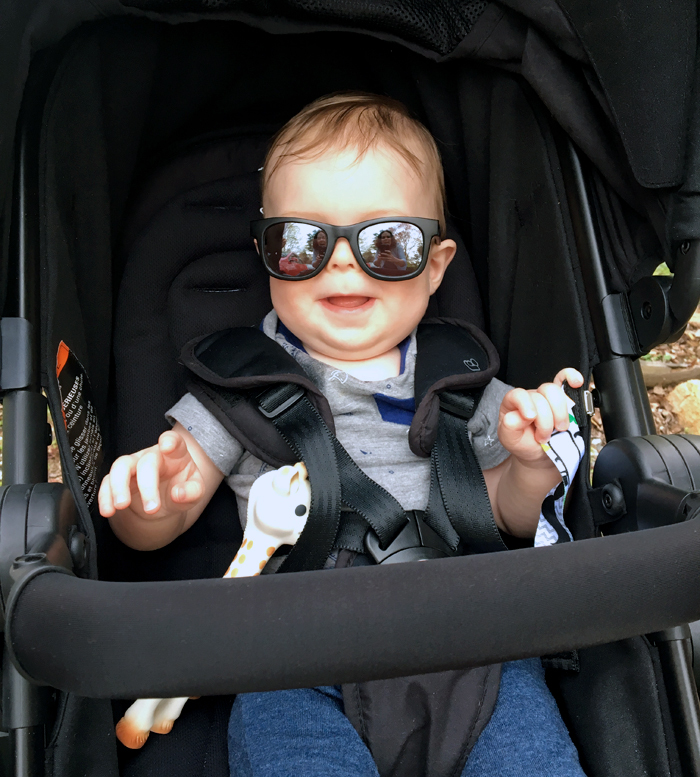 I had thought very little about the first three months, so I had no idea how fun the fourth, fifth, and sixth months of your child’s life would be. I absolutely love being recognized, babbled to, clung to, and reached for. 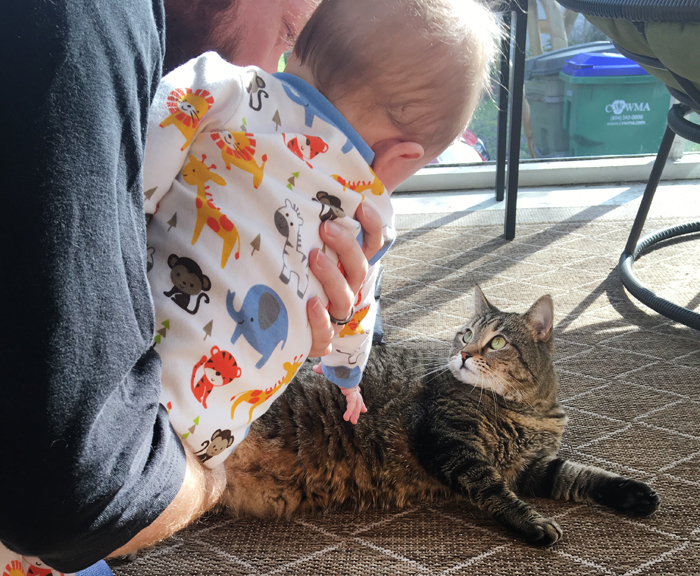 Des definitely knows and loves his mama, daddy, and even Rory, who seems to like him too—from a distance. He’s so much more aware, alert, and playful these past three months. The laughing is out of control, and I love it. Though with the fun has come some challenges. Teething was rough (but we have two bottom teeth! ), as was the four-month sleep regression. We’re also reaching a point where we can’t really just leave him someplace and expect him to be in the same spot when we return. This rolling over thing is going to turn into scooting and crawling before long. I admit that I had a moment yesterday, which was just one of those days, man. Things felt impossible, I had no time to accomplish anything, and little dude was in the worst sort of mood. I felt defeated. As I held a screaming, flailing child in my arms and rocked and hummed in an attempt to get him to nap, my mind wandered off to all of the things I would have been doing just a little over a year ago, on a day I had all to myself. I thought of how I’d randomly ride around downtown snapping photos after running errands, or how I could try on clothes (that might even fit correctly) without needing someone else to go with me and hold my baby, or how I could simply sleep for up to eight hours uninterrupted. I thought of date nights and day trips and other simple forms of spontaneity that dissipated with the arrival of our bundle of joy. I took a moment to mourn the easy life we left behind, as I have done more than once since our life changed so drastically…and don’t believe for a second that other parents you know haven’t done just the same every once in a while. Finally, Des did nap. I managed to check a few of the most pressing things off my to-do list, which calmed me down and made me feel better about my day. As soon as Dan was off work, the three of us headed outside for a walk around our neighborhood in the most perfect spring weather. I bought Des the tiniest pair of sunglasses, so I popped them on his face and was surprised that he seems to like them. We laughed and talked and came in to make dinner together, after which we gave Des a bath where he kicked and splashed and smiled. We finally retreated to our bedroom, where we all lounged around together for the last bit of the evening, and everything felt so right. Despite my moment of frustration and nostalgia earlier in the day, I felt joy in my little family and our new life together, now. I love being a mom, and I love being his mama, even on the hard days. Watching him grow and change and seeing his delight when learning or trying new things completely overshadows any of those “moments” I have. Things are just different now, and we’re learning all about how to live this new life together. Mr. Steal your girl!! <3 He is the cutest!! And I get you, motherhood is intense and there are so many ups and downs but it is breathtaking. You are doing such a great job! He’s so cute and getting big! Holden is just over 7 months and still no teeth! Sheesh! Haha. It’s fun to see how different kids are when they’re similar in age. A couple Dan works with have a 7.5 month old and she doesn’t have any teeth either! And yes girl, solidarity haha.